It’s been quiet around here, I know. But behind the scenes life has been happening and it’s all taken place outside of my kitchen. There’s been no time to stand still or to get lost in routine which, for me, means having a regular cooking schedule and the time to photograph the dishes so I can share them here with you. Instead, my husband and I have happily entertained dear friends from Chicago, Salt Lake City and Tucson–all in the last couple of weeks. They’ve been whirlwind visits, one set of friends arriving immediately after the departure of the previous. It’s been fun to catch up with all of them though the time spent reminiscing about old memories and creating new ones was not enough. We spent a couple days in Healdsburg for a bit of wine tasting and great eats then returned to Napa Valley again the following weekend for more with my best friend. We even managed a beautiful day at the beach and some nights we just sat around the kitchen table over wine and small bites–through it all my camera took a break (I did share highlights on Instagram). Today I’m spending my first quiet afternoon since all the excitement started a few weeks ago. Silence and solitude are almost strangers to me but I welcome their return…along with not having a full agenda. The oven is back at work on a cake I’ve been meaning to bake all summer. Maybe it will even turn out to be fit for company though our friends I’d love to share a slice with are now such a distance away. Today, life has returned to its normal pace though I’ll admit that I’m missing the rush from the last couple of weeks. This recipe comes together very quickly, especially if you already have cooked chicken available. It’s also flexible, allowing you to highlight your favorite ingredients. 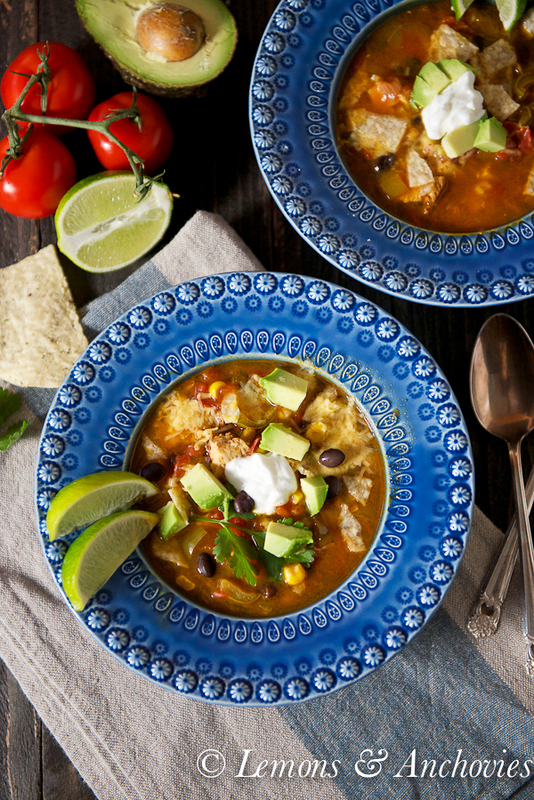 I like the clean, fresh qualities that corn and Anaheim chiles impart to this soup so I recommend that you don’t skip them. Otherwise, feel free to improvise. Make this bowl of comfort your own and just use my recipe as a guide. This homemade version of a restaurant favorite is loaded with clean, fresh flavors. Using a large pot, sauté the onions in a tablespoon or two of olive oil over medium heat until translucent, about 2 minutes. Next, add the fresh tomatoes, jalapeno and anaheim chiles. After a couple of minutes, add the chili powder, cumin and pepper and salt and cook for about a minute to release the flavors of the spices. Add the canned tomatoes, the stock and minced cilantro. Bring this to a boil then turn the heat down to let it simmer for about 15-20 minutes. Finally, add the corn, black beans and chicken and simmer for another 5 minutes. Ladle in individual bowls and top with your favorite garnish. 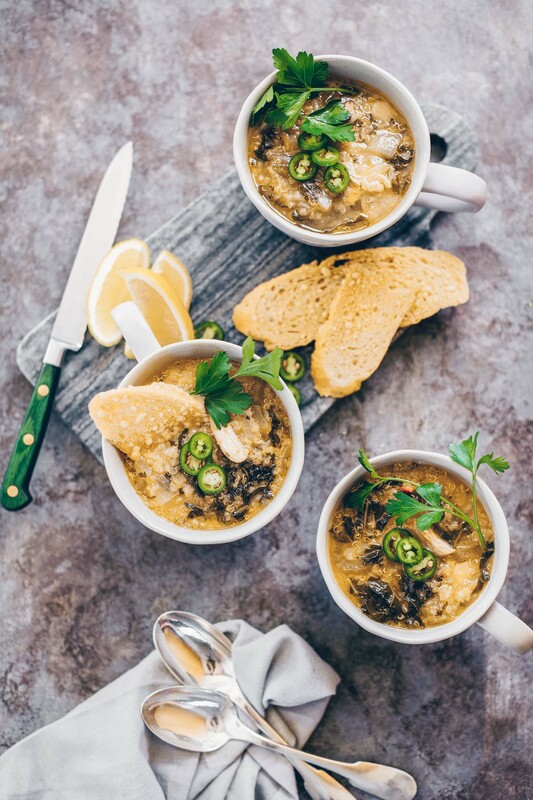 This is one of my most favorite soups and yours looks so comforting and delicious – perfect for a cozy fall evening! I love this! I’ve been meaning to make this soup for the longest time – thank you for the inspiration. And, as ever, your photos are amazing! I love that it’s finally soup weather, what a gorgeous reminder to get the stove going. One of my favorite soups. Gorgeous. One of our family favorites and yet your recipe looks like it could take time off my usual prep. Beautiful photos, too. Thanks for sharing. Wonderfully comforting! A delicious cold weather dish. A comforting soup for anytime. Lovely colors and the pictures are gorgeous. 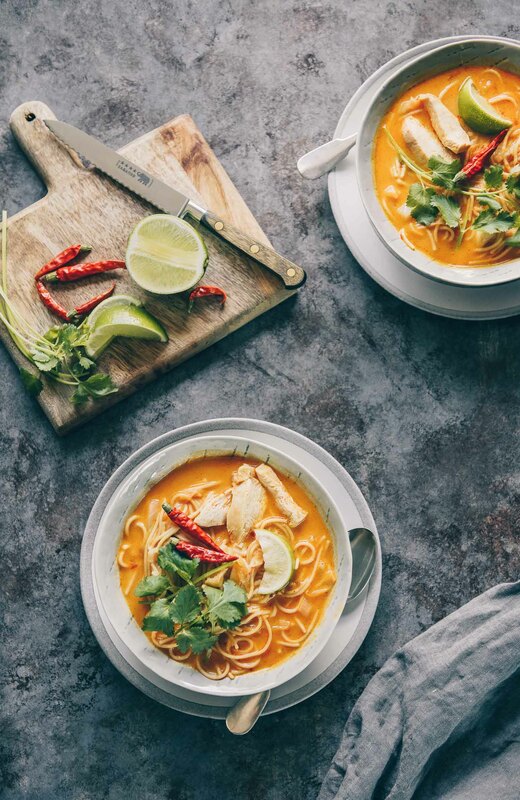 I love tortilla soup and yours looks amazing – I really can’t recall your photos every lacking and I’ve been following your blog for a long time, Jean! 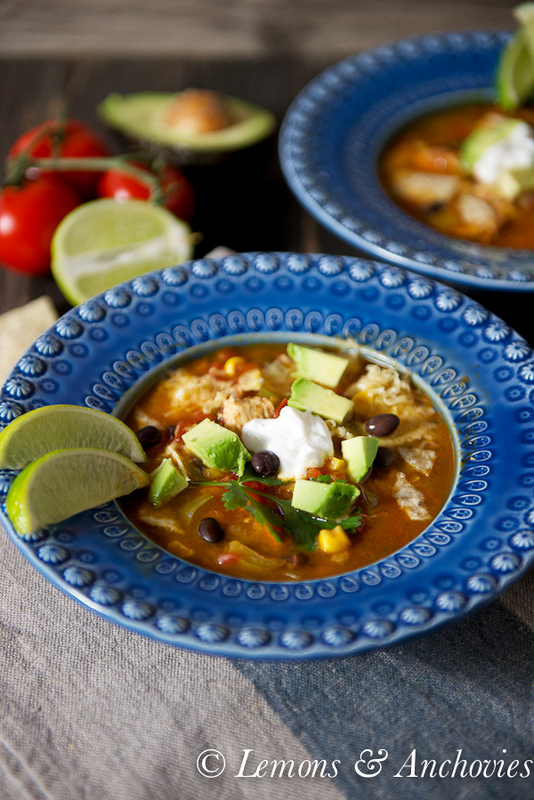 Jean, chicken tortilla soup is one of my favorite soups that I never get tired off. Sounds like you have been pretty busy. 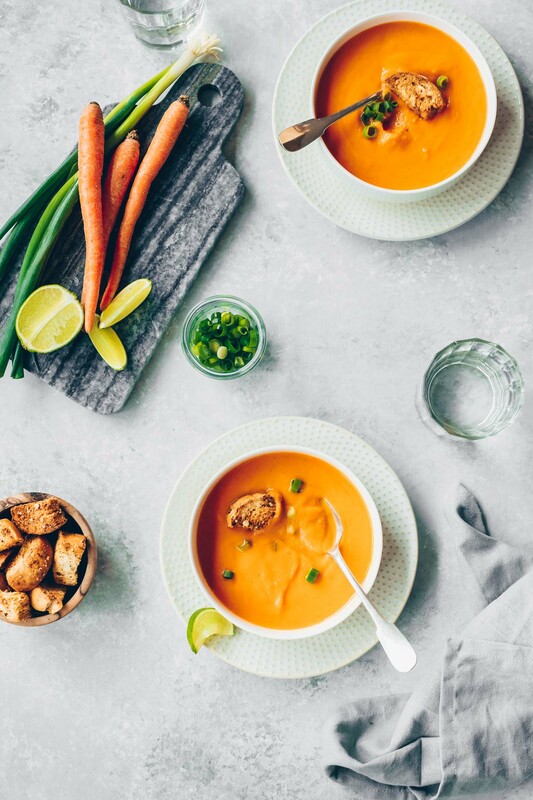 Your soup photos are so good, they look so comforting and cozy perfect for this Fall weather. 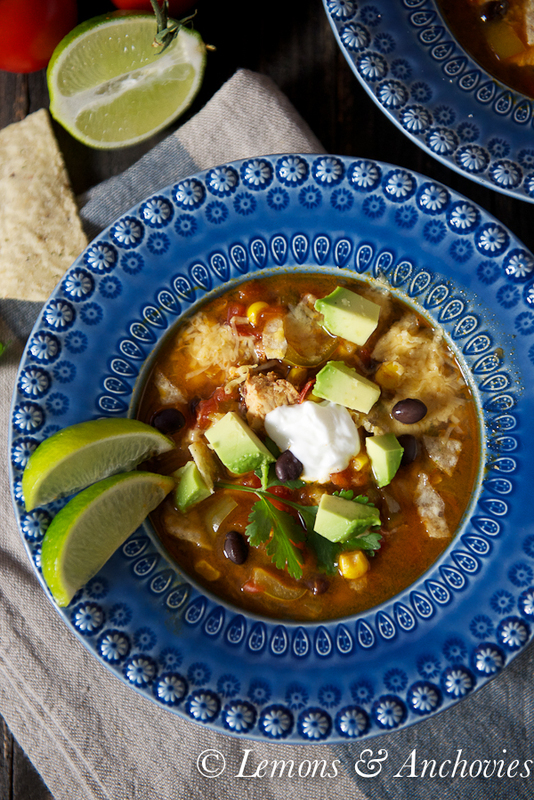 I love making chicken tortilla soup for our family and with baby #6 on the way, I have definitely been craving some soup this fall/autumn. Your timing with re-introducing this favorite, is perfect. I’ll have to give your recipe a try. Hope all is well. God Bless! Wow, Genevieve, congratulations! 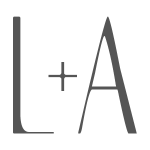 Haven’t seen an email update on your blog or did I miss it? Thanks for connecting and letting me know. God Bless! I’ve waited too long to finally ask you about those lovely blue soup bowls above. Where can I find some? They would look lovely on my table this Fall, during Tortilla chicken soup season. BTW I love so many of your recipes. Sorry I’ve waited this long to email you. Thank you!